We're disappointed that the unions are taking strike action which will do nothing to secure the future jobs of Remploy staff. The Government would encourage the trade unions to fully engage with Remploy during the consultation process to provide the best possible support and success for disabled staff who may leave the company. The Government's actions smack of a callousness that makes a sham of its 'we are all in this together' mantra. The public is very angry at the Government's behaviour. While a leading disability charity backs the shutdown, strike action against Government closures of 27 factories reveals a complex issue. Remploy worker Steven Collins said he feels let down by the Government as he faces redundancy in the planned closure of half of the firm's factories nationwide. Read more on today's protests in the region at ITV Central. Disabled workers across the country are striking in protest at the Government's planned closure of half of Remploy's 54 factories. For more on ITV Central's coverage of the strike action, including an interview with a worker at the firm's Derby plant and footage of chanting on the picket line in Stoke-on-Trent, click here. Similar protests have attracted politicians and the press alike in Bridgend. ITV News Wales has the full story. Disabled worker Neil Pearce said the shutdown of half of the company's factories across the UK is a "cop out" by the Government. Disabled people in Remploy have not taken lightly the decision to withdraw their labour. These are workers who do not have large amounts of savings. So for them to sacrifice a day's pay shows the passion with which they are trying to save their jobs ... [The Government's] decision to force the closure of Remploy means that thousands of disabled people and their families will be put into poverty and their health is bound to suffer. We are expecting the vast majority of the workforce across the 54 factories to strike. They are rightly angry that they face a bleak future on the dole, as it is always more difficult for those with disabilities to obtain employment. Disabled workers will stage the first of two 24-hour strikes today in protest at "hard-hearted" plans to close their factories. 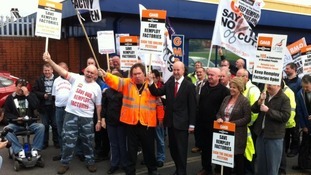 Thousands of staff at 54 Remploy factories across Britain will walk out as part of a union campaign to keep them open. Half the factories face closure by the end of the year, while others face an uncertain future or closure next year under Government plans. Ministers have argued that the factories are loss-making, and money would be better spent helping individuals find jobs elsewhere.